Live the moment. Don't let running out of storage keep you from capturing that perfect moment. 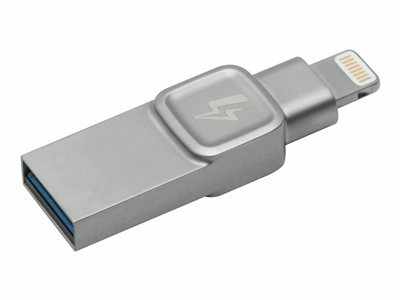 The Bolt is an easy way to extend storage space to your iPhone or iPad. Think of it like a flash drive for your iPhone. Simply plug it in, download the Bolt app, and then back up your camera roll. Never miss a moment, snap more pictures with the Bolt. In a hurry? Shoot pictures/videos and save directly to the Bolt. Transfer your memories and make space for new ones. Easy to take with you using the included accessory.